A baby’s teeth start to come in (erupt) when the baby is about six months old. By age three, most children have a full set of 20 baby teeth. Baby teeth will later be lost (shed) as your child grows. This makes room for adult teeth, which begin to come in around age 6. By the time children are teenagers, they usually have all of their adult teeth. 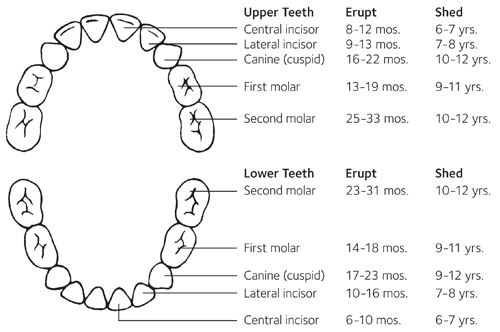 The chart below gives the names of the baby teeth. It also shows when each tooth usually comes in and is lost. Not all children get the same teeth at the same time. Your child’s teeth may erupt earlier or later than shown here. If you have any questions about your young child’s teeth and the timing of their growth, please call our office.